Rotate rugs to even out any possible sun fading, and to not allow one specific area to get all the foot traffic wear. Rotate small rugs every 3-6 months. For larger rugs, rotate every time it goes for a bath and put it in the opposite direction. Quarterly, you will want to inspect your rugs closely for insect activity. Moths and carpet beetles generally begin feasting in areas that have little light and little air flow. This makes the back of the rug and areas under the furniture a couple of their favorite places. The larva looks like "sticky lint" so flip over the corners to see if you have any activity. American Indian weavings hanging on the wall are particularly vulnerable so take them down biannually to shake and dust them and look for bugs. You also want to check the ends and sides of you rugs to make sure they are not in need of repair. When French tassels become worn and torn, the wool or silk knots of the rug begin to pull away from the rug. If this is caught early, it is much less expensive to repair than reweaving a section of the rug down the road. 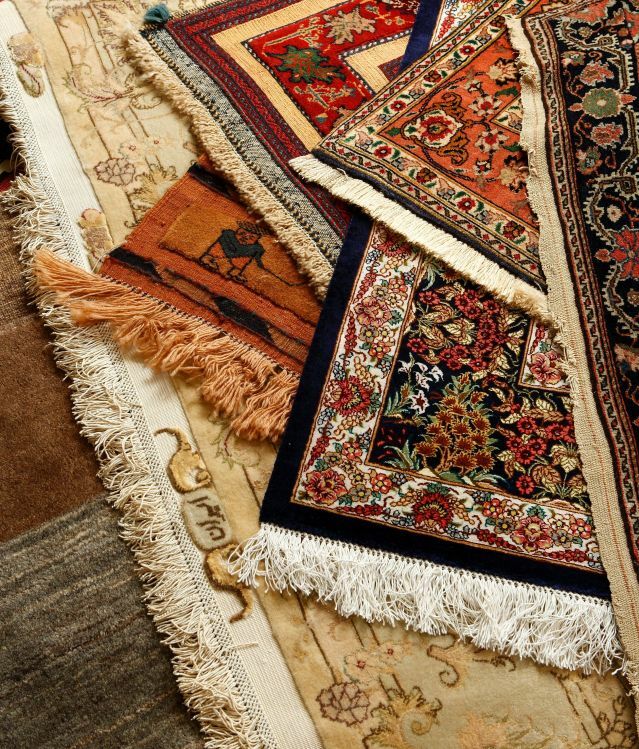 Many newer rugs, especially Chinese rugs are chemically washed to give them a nice "sheen". This chemical process makes these sensitive to sunlight and they will fade in a period or just a few short years. If this concerns you, consider treating your windows with a UV-filter coating or use thicker window coverings to block out the rays during peak hours. Carpet Spot Removers contain aggressive chemical agents and are not safe for wool rugs. These chemicals can be too strong to use on rugs and can either cause a chemical discoloration or it can bleach out the rug dyes completely. Baking soda also can cause damage by yellowing fibers. This damage can be permanent and can devalue your rug. Please stick to club soda as a cleaning agent. Even careful plant caretakers spill a bit when watering plants. This water seeps into the cotton foundation which leads to mildew growth and dry rot. When dry rot sets in, the rug falls apart in that area of rot. It ruins the ru.